Surface modification and preparation techniques for textile materials; Textile surface characterization methods; Textile surface functionalization by physical vapour deposition (PVD); Surface grafting; Modification of textile surfaces using electroless deposition; Textile surface functionalization by chemical vapour deposition (CVD); Enzyme surface modification of textiles; Modification of textile surfaces using nanoparticles; Modification of textile surfaces using sol-gel technique; Nano-modification of textile surfaces using layer-by-layer deposition methods; Surface modification of textiles for composite and filtration applications; Surface modification of textiles by aqueous solutions; Surface modification of textiles by plasma treatments; Emerging approaches to the surface modification of textiles. The surface of textiles offers an important platform for functional modifications in order to meet special requirements for a variety of applications. The surface modification of textiles may be achieved by various techniques ranging from traditional solution treatment to biological approaches. This book reviews fundamental issues relating to textile surfaces and their characterisation and explores the exciting opportunities for surface modification of a range of different textiles. Introductory chapters review some important surface modification techniques employed for improved functional behaviour of textiles and the various surface characterisation methods available. Further chapters examine the different types of surface modification suitable for textiles, ranging from the use of plasma treatments and physical vapour deposition to the use of nanoparticles. 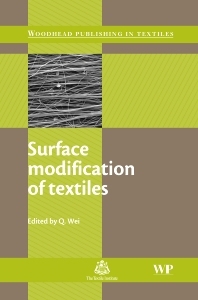 Concluding chapters discuss surface modification strategies for various applications of textiles. Surface modification of textiles is a valuable resource for chemists, surface scientists, textile technologists, fibre scientists, textile engineers and textile students. Qufu Wei is Professor of Textiles, Science and Engineering for the Ministry of Education’s Key Laboratory of Eco-textiles, based at Jiangnan University, China.